Nuxe Splendieuse Anti-Dark Spot Perfecting Mask 126 ml order online. 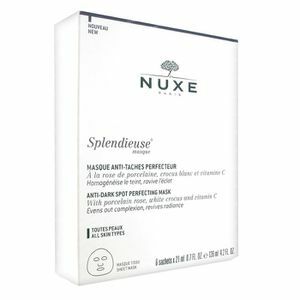 The Nuxe Splendieuse Anti-Dark Spot Perfecting Mask is your weekly treatment mask to correct and fade pigmentation spots and refresh your complexion to a radiant state. 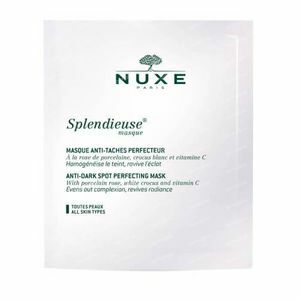 In a mere 10 minutes your skin is smoother, hydrated, fresher and more even toned with less visible pigmentation spots. 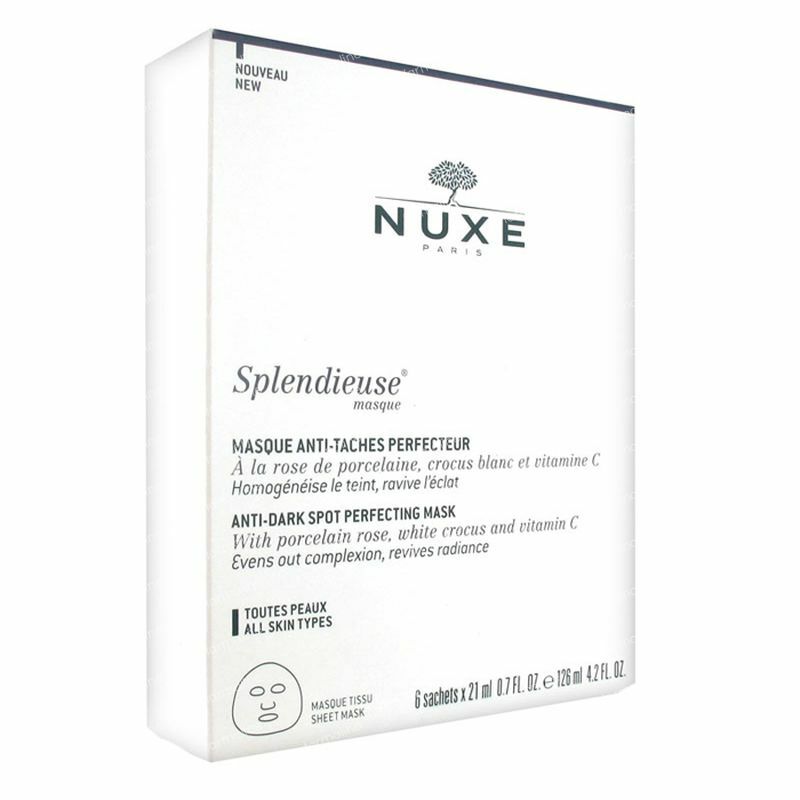 A brightening and pigmentation correcting sheet mask for all skintypes with pigmentation issues. Gently cleanse your skin and pat dry with a clean cotton towel. 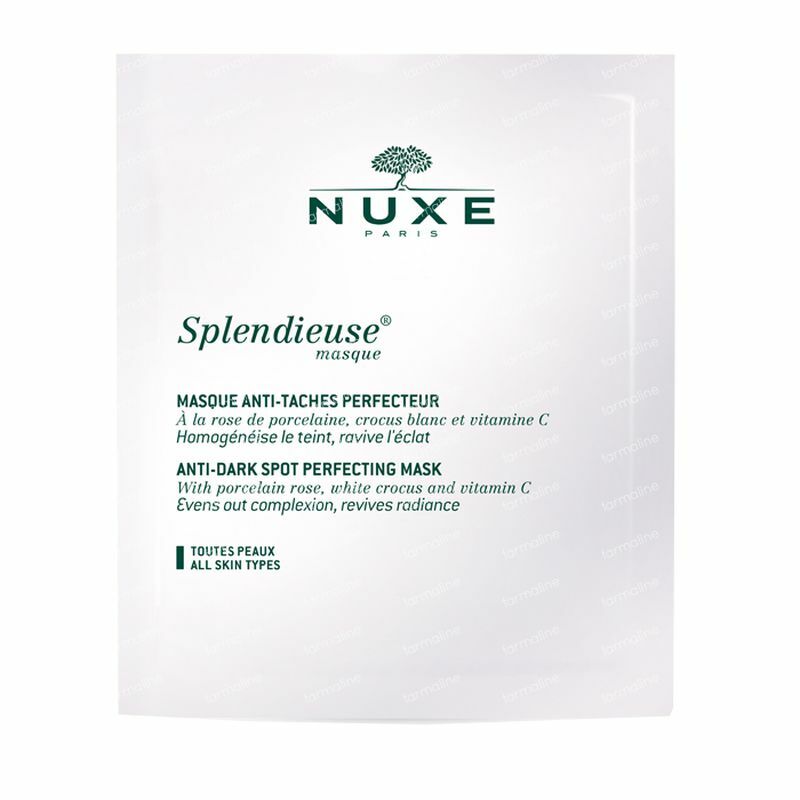 Remove the sheet mask from the package and place it onto dry skin, making sure that the mask adheres well to the skin. Leave it on to work for 10 minutes and then remove the mask in a smooth gesture from the face. Massage in the leftover essence/serum. AQUA (WATER), BUTYLENE GLYCOL, GLYCERIN, ALCOHOL DENAT, MALTOOLIGOSYL GLUCOSIDE, ETLINGERA ELATIOR EXTRACTN PHENOXYETHANOL, XANTHAN GUM, PARFUM (FRAGRANCE), HYDROGENATED STARCH HYDROLYSATE, DIMETHICONE, ASCORBYL GLUCOSIDE, DEHYDROACETIC ACID, BENZYL ALCOHOL, SODIUM CITRATE, PPG-8 CETETH-20, CARBOMER, AVENA SATIVA (OAT) KERNE; EXTRACT, ECHORNIA CRASSPIES EXTRACT, PRUNUS SERRULATA FLOWER EXTRACT, CITRIC ACID, CROCUS SATIVUS FLOWER EXTRACT, SUCROSE, PANCRATIUM MARITIMUM EXTRACT, SODIUM BENZOATE, SODIUM HYALURONATE, SODIUM METASULFITE. like, like, like it very much. I usually working with computer. After using this mask, my face becomes more bright. So I will keep use it twice per week.